We have seven boats plus one privately owned. Fleet dues are about $300/ yr for the initial 24 folks who each paid a $1500 initiation fee (to buy the boats and the fix-em-up). For members who came in after the boats were capitalized, they pay a higher yearly fee - $450. The yearly maintainance fees take care of bottom cleaning, painting, sail and boat repairs, fittings, line etc for continual upkeep. We find that we can't afford our own boatyard fees so we do our own work or subcontract wherever possible (rather than pay the Gibson Island Yacht Yard prices for work on the boats). We put together a fleet of seven 210s for about $6,000 each. That includes new Jenkins sails. Split between the 45 or so members this isn't bad. I’ve put untold hours into getting the boats going and had lots of help. It's what I wanted to do. I've enjoyed it. Our biggest problems are getting members out to sail. We sail the boats doublehanded to maximize the number of boats out. On occasion, we have had a great turnout. The boats, to be honest, are pretty crappy, condition wise. As a sailboat, they are lovely. If I were doing it again, I'd get better 210s to start with. That said, they've held together just fine and seem to be reasonably equal in speed. We host a 210 Class event each year and have about a dozen boats racing on the river. We differ from the class in that we only use blade headsails. For that regatta we ask the visitors to just use blade jibs only. Our boats actually do pretty well (probably because we are used to sailing with the smaller blade jibs). Last year we had a huge squall come through and we sank one of our boats on the Magothy River …. two of the out-of-towners swamped but they had floatation and easily bailed out. Ours went down in seconds. We refloated it and all survived. Any “Earwigoagin” reader is welcome any time to come sail a 210. Most activity happens in the Fall and Winter (after all our other boats are put away). Come join us for more socialist fun, Comrades. Your humble scribe went Wednesday Night racing on Jim Mumper's Cal 36. I must admit I'm not very good at it; I just don't do it enough, being content to play mostly with small sailing boats. Jim said he was short handed but when I showed up at the dock he already had 6 plus himself. It turned out there was enough regulars to run the boat and I could simply hide my incompetence by rolling across the cabin top during the tacks, being careful not to ensnare my foot in a jib sheet. So for most of the race, I draped my feet over the gunwhale and took in this Wednesday version of PHRF racing. A picture perfect evening; southerly breeze around 15 .... just beautiful. We were starting together with J-30 one designs who were scored separately. For us, our main competition were the J-80 sport boat and some hot 30 foot MORC racer. Our start was good and I was told the Cal 36 didn't tack so well, which to me meant tactics were going to be in very broad brush strokes (as in choose one layline or the other, punch through those niggling little shifts). So, halfway up the first beat, on our first hitch onto port, some J-30 executed a perfect slam dunk on us.....GRRRRRR! You would think someone in another class would cut us some slack ... but NOOOOO! It seemed my job for the night was to call the laylines, which became difficult as it became apparent that the old warhorse lacked the height upwind of the newer classes. But given the distance added in the time lapse between when I thought we should tack, and when we actually did, we never had to squeeze for the marks. Offwind our waterline length helped us catch up ... and we got the spinnaker up and down fairly quickly and despite some small snafus like me dumping the spinnaker halyard all at once (handled very adroitly by our crew) we acquitted ourself very well. On the short beat into the harbor and the club finish, our pointing inability came back to bite us. We had to make an extra short hitch to get around the very, very big yacht docks and finished 3rd to our two rivals, only 39 seconds out of first. All in all a very pleasant ride. The Classic Moths were over at historical and picturesque Chestertown, Maryland on July 11. Not that sailors ever stop to look at anything historical or picturesque as they dash to the Yacht Club. Let me note that the Saturdays farmers market in the town square looked very picturesque and worthy of stopping for a gander if the missus was in the car. But luckily she wasn't and we were late so it was.... stamp the tourist snapshot into the brain for the 20 seconds we were at the stop light.... and then off we went, 1/2 mile out of town to the Chestertown Yacht and Country Club. Ten Classics showed up. A summer regatta at Chestertown has always been popular with Moth boaters but there was a time when the Chestertown Yacht and Country Club became more Country Club than Yacht Club. Thankfully, through the efforts of Bob Patterson, small boat sailing is making a comeback and this was the first summer regatta in several years. The Chester River is narrow up at Chestertown, the sailing is always shifty... like lake sailing except for a wicked current. This year we had some breeze out of the south, building throughout the day. In the racing the choice seemed to go right for some big lifts and also some big holes, or stay left in some steadier breeze. It didn't matter much because the weather mark was tucked up at the bend of the river and left and right shifts became willy-nilly up there. He who lucked into the last shift got around first. The afternoon brought more wind with some wicked gusts. The log canoes racing at Cliffs City, about 2 miles downriver, really struggled in the breeze; I think 4 out of 7 capsized. Mike Parsons and John Zseleczky continued their battle from Brigantine and finished 1,2 in the higher performance Gen 2. Regatta organizer Bob Patterson finished 3rd in Gen 2. George Albaugh, sailing the 2004 Europe that won the Olympic Trials, finished first in the slower Gen1 class with Ed Salva in another Europe, second and Victor Stango in a Shelly, third. Tip of the hat to Bob Patterson who pulled off a great regatta. The Gen2 leaders Mike Parsons and John Zseleczky doing battle. John, why is your right foot up around your ears in this photo? Gust on! Why is the 150 pounder on the left handling this gust better than the beef brothers on the right? Start of one of the morning races. Great video of Contenders sailing in big breeze and big waves during the 2009 Kiel Week. Hairy conditions for these boats. 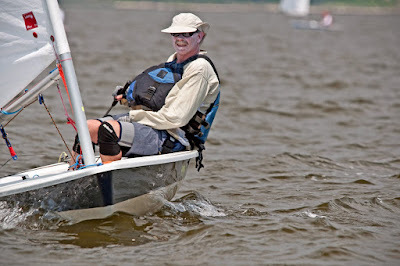 I sailed a Contender once in a club race at West River Sailing Club. Puffy conditions and I discovered there is plenty of power in these boats. I stumbled quite a bit but didn't capsize. This class continues to get over 100 boats for the Worlds showing that it was a good thing it was never chosen for the Olympics (it came out on top of the three singlehanded trials the IYRU ran in the late 1960's for a projected replacement of the Finn). Rod mentioned that there are a host of people out there with fond memories of their Sea Snarks. I’m one of them. Actually I’ve owned two, both given to me. Did anyone ever pay for a Sea Snark? My first Snark was used for about five years until it blew off the dinghy rack in a big storm. At that time I was under the misguided impression that someone might try to steal it so I had a lock and wire rope running through the daggerboard trunk and around the rack. In the big winds the wire ended up cutting my boat in half – into bow and stern sections. It seemed like a big job to cut up the rest of the boat for the dumpster so instead I gooped up the break with epoxy and sawdust. That became a main structural member and the boat went back in service for another four or five years. Mushroom anchor barge – loaded a 200 lb mushroom and lots of heavy chain in the old Snark, swam it out to the prescribed location and flipped it over; presto! Dinghy rack hoist – my Snark was on the bottom shelf of our dinghy rack during hurricane Isabel. The storm surge that followed brought the water level 8’ above normal. My Snark refused to stay underwater and lifted the whole dinghy rack up. Rowing shell – after my second kid was born I was broke but had visions of building a rowing shell. I built a pair of hollow-shaft basswood Piantedosi-type oars but the rowing shell never got built. Instead, I built a sliding seat rig with outriggers and plopped it in the Sea Snark. This thing flew! I rowed all up and down the Severn with it, including a trip around St. Helena’s Island with my 18 month daughter napping in the stern sheets. True Sea Snark connoisseurs scoff at the idea of encapsulating styrofoam cooler material in plastic. The plastic coated ones never lasted long anyway. Does anyone know the true lineage of the Sea Snark. I’m convinced it’s a 25 lb miracle of naval architecture and would love to hear about its origin. Einstein said “make everything as simple as possible but not simpler” … maybe the Sea Snark was one of his ideas. Hope you don't mind my making a suggestion: your traveler line is way too loose. The boat sails much better upwind with the traveler as tight as you can get it. Thanks Tillerman! I've heard keeping the traveler block down on the leeward corner is fast even in the light stuff. Back in the days .... you know those days, we would keep a reasonable tight traveler on a Laser but not so tight as to completely saw through the wood tiller (most of us still had pretty deep groves). Not a problem today with the low profile carbon jobs. Why on the Laser do you need to park the boom over the leeward edge of the transom ... even in light air? Europe dinghy, Finn, Classic Moth etc. are keeping the booms more centered in light air. What's different about the Laser? Music for Fridays; Count Basie, "Swingin' the Blues"
Count Basie and Band .... rockin. Remember my post on my Laser outing during the SSA Summer Series . Well "Che A Matthews Hale" was out taking pictures and took a rare one of me. For those who wonder why my life jacket is half off; I removed the jacket to cool off as I was late getting to the start area for the first race ..... surprise, surprise, I was only a minute late to the start and there was only time to get the jacket over the shoulders and, in my effort to not finish last, I never had time to zip it up during the race. I'd say this pretty well fits the "Faux Laser Sailor" look. My wife says my summer war paint scares women and small children. A YouTube on refurbishing a Sea Snark popped up recently and jogged my memory. This quintessential piece of sailing Americana has all been ignored by the sailing cognoscenti, a trend I hope to reverse by opening up this blog to Sea Snark stories. 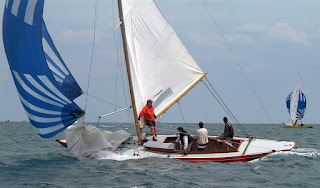 When my sailing friends gather and we all are well into our cups, inevitably Sea Snark stories start spilling forth ..... what do you expect for a solid styrofoam dinghy with a pencil thin mast and usually a tobacco brand plastered over the lateen sail. So pony up your Sea Snark stories. Put them up on your blog. Add them to comments on my threads. Go over to my profile and email them to me. Click here to see other Sea Snark stories on Earwigoagin. To educate those who may not have had the opportunity to sail a Sea Snark. First the Wikipedia entry for the Sea Snark . Tom Price has sent me a note that he won the IOD Invitational at Nantucket YC recently. What significance is this other than to tout Tom's racing prowess? Well Tom wrangled a guest invite to the IOD Invitational because he is the godfather to the socialist 210 fleet at Gibson Island YC and the Nantucket YC IOD fleet is also (gasp!) socialist run. How do you red bait these two upper crust yacht clubs as (oh! horrors!) socialist? Well, no individual ownership...both these fleets are run like J-World; you pay your yearly dues and get to rotate in and out on the fleet boats. What little I know of Tom's operation is the fleet has seven 210's (Ray Hunt design, double ended, narrow) with about 50 members who pay around $1000/yr (maybe a bit less). They are raced as a frostbite class at Gibson YC. I'm sure I will wrangle Tom to fill in the details on this cheaper way to sail on some very pretty traditional designs. Tom has been a slim keeler fanatic from way back. He has owned several different makes and models. I have a vague recollection of sailing one of them with Tom ,my new wife and maybe Pete Teeling or Bob Brannan on South River in a nice seabreeze. My wife, who assumes all sailboats will tip over and sink, wore a gritty frozen smile and kept a death grip on the weather coaming as we spent most of the evening over at 30 degrees. A real trooper. Postscript: Two names from my past also popped up at the Nantucket YC IOD Invitational score sheet. Laser buddy from the 70's, Kin Yellott crewed for his wife Sandy who finished second, and International 14 sailor from the 70's, John Pulverman, started off with a bang with a 1,2 but a DSQ and so-so last day pushed him down to 10th. Tillerman's latest writing contest is a toughie for me. Sailing gear reviews are out because if you ask me why I bought, say, the Musto XYZ smock over the Gill HPC smock over the Henri Lloyd LQM smock, 9 times out of 10 I'll say "I found it on sale at the Annapolis Boat Show". Price trumps all those nifty product features every time. Book reviews are out because my sailing library is all out of print, old ...old books. Nothing worse than me touting the merits (or demerits) of a book that can only be found by scouring the used book websites. Plus, I don't read much in the way of sailing books now anyway. This is not to say I don't enjoy reading reviews. Nothing better than reading informative, sometimes snarky book reviews. According to a book review in yesterdays WaPo; did you know that we spend an average of 5% of the day (36 minutes to be precise) chewing our food. And Steak Tartare came about because the Tatars, when they rode into war, put a steak between the saddle and horse to soften it up. But I digress.. There is one magazine that is the Consumer Reports for Sailing; almost their entire content is boating product reviews. Practical Sailor is a magazine I overlooked for quite a while until I started getting hand-me-down copies. A large part of what they review applies to the cruising crowd but I seem to find at least one review per issue that captures my interest. Their testing is thorough and the results are interesting. And they add how-to articles to spice things up. 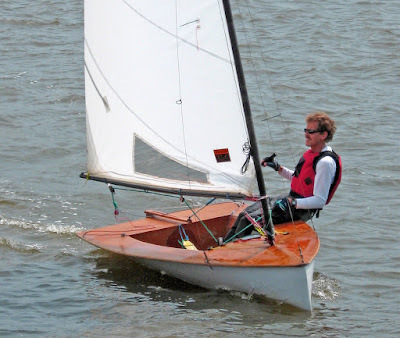 They had a two part series on how Skip Allen set up his 27 footer for singlehanded racing. Practical Sailor doesn't seem to be readily available in book stores, but the $20 introductory subscription price is reasonable. The only thing they don't do well is give me a heads up on what items will be on sale at the Annapolis Sailboat Show. Two weeks ago, at the SSA Tuesday night series, I was bringing up the rear of the Laser fleet in my wooden Classic Moth when I crossed paths with a Lightning racing in the two sailed fleet. I crossed astern going upwind as the Lightning was running downwind under spinnaker. Two things caught my eye; a young toddler was perched on the back deck, happily pulling the spinnaker guy back and forth despite the admonitions of a crew intently trying to keep the spinnaker flying. Secondly, the Lightning was an old woodie, usually an indication that the crew are rank beginners who found a great deal, bought the old warhorse and then decided to try racing it. Back on shore, I met two of the Lightning crew (woodies seem to gravitate to woodies) and they immediately put to bed my initial misperceptions. They were knowledgable and enthusiastic and actually searched out the old wooden Tom Allen Lightning (my guess, circa 1960's). They are convinced a wooden Lightning can be as fast as the current glass models and so, here they are, men on a mission. The sight of the wooden Tom Allen takes me back to the 60's, to my later teenage years in Youngstown Ohio. Of all things, in this steel town in middle America, I joined a Sea Scout troop with Dr. Charles Maltbie as "scout master". Maltbie was a cracker jack Lightning sailor, won the Districts and had finished top ten in the Nationals. 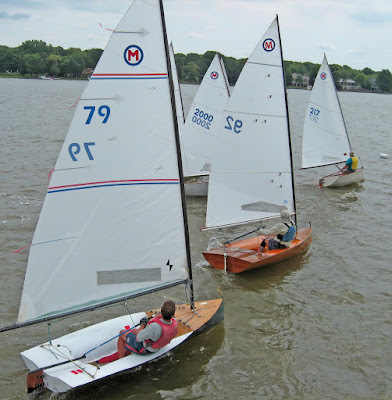 He owned a beautiful yellow wooden Tom Allen Lightning and as Sea Scouts we spent a fair number of weekends racing Lightnings out of Pymatuning Yacht Club. Winter time, Dr. Maltbie, a very good woodworker, had us building a Blue Jay which we subsequently launched and sailed (If I remember correctly, it was also painted yellow). Back then, Pymatuning Yacht Club, was THE YACHT CLUB in NorthEast Ohio/Penn region. The Lightning and Thistle fleets were big and competitive and PYC had the reputation of where the most serious and best racers sailed. It was also a mobile home park. There was enough property that members set up small mobile homes and the yacht club became a summer weekend retreat. For young teenagers, it was like summer camp, except your parents were not too far away. For fellow "Sea Scouters", Buzz Brown, Klein, Stuart, Trevor ..... great memories. 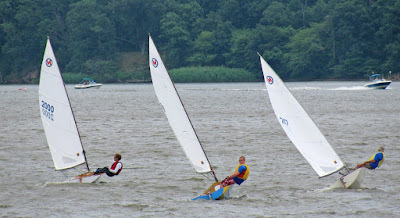 Over at the APS blog, James just attended the 2009 Independence Day Regatta at Pymatuning YC and writes about it here. First up, some glass harp music. These patriotic tunes are a week late for the fourth of July. I lied in the title, the glass harpist Jamey Turner , is definitely not an amateur! Incredible sound! Next is a suprisingly good ukulele cover of the bluegrass gospel tune, "I'll Fly Away, best known as performed by Alison Kraus and Gillian Welch in the movie, "O Brother, Where Art Thou". Music by Todd Baio. About a month ago, I took my trusty digicam on a boat tour of my front yard. I must acknowledge the patience of my wife, though stretched at times, has looked the other way at what others in our neighborhood (not so nautically enlightened) may consider an eyesore, all those #%@#$$ boats. Sticking with a guitar theme this week. This is some amazing acoustic! Zen of Daysailing; Oh No! A Thunderstorm! You take four of your best buds out for a daysail on a catamaran and what happens .... the wind dies as a thunderstorm approaches. Got to hand it to the camera man on this one. Susan Pegel had a list of 7 check offs you need to be a real Laser sailor. Since I only can check off #4 (No coaching! ), I now hereby assign myself to the other Laser group, the Faux Laser Sailor (Faux being French for false and the French language, always sounding more sophisticated than English, I'll use it.) 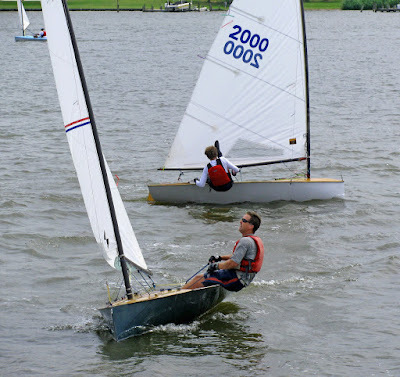 Anyway, typical of a Faux Laser sailor, I borrowed a Laser for the one day SSA summer series last weekend. Being the stubborn older cuss I've become, I enjoy a relaxing Saturday breakfast whilst reading the WaPO paper, which puts me definitely behind the curve as far as SSA's racing schedule. I drove into the club to make the last two minutes of the skippers meeting; the harbor start saw me taking the cover off my borrowed Laser. All the newfangled controls on the Laser finds me running to whatever Laser hasn't launched yet to discover how that outhaul blocks snakes over the SS hook. Oldster sailors like me spend more time saddling up the gear; slather on the sun block, sun hat, plenty of water, sun shirt, some knee pads for those troublesome joints, one of those neoprene hiking pants I bought last year. I was the last to launch by a long shot, but surprise, surprise as I slopped along toward the start area, the Laser fleet was still milling about the start area. There was a remote possibility I could get there but the wind was slowly dropping. Close but no cigar. I was late by about a minute and (although I didn't know it at the time) at the wrong end of the line going to the wrong side. They say beggars can't be choosers! I still had a good race with the back six or seven (including one or two hot shots who guessed wrong on the first beat). The wind that day was a light NE about 5 knots which at least kept you on the high side. The motorboat chop was, as usual, vicious, particularly on starboard tack. My goal in the SSA Lasers is middle of the fleet which I fulfilled admirably in the next two races. Unfortunately, the second race where I managed to tack into two unintentional lifts on the last beat, went unrecorded. I finished overlapped on the inside with a Byte who was rounding his weather mark (the finish and weather mark were one and the same). I got the double whammy. He obscured me from the finish boat so I got scored a DNC and then he proceeded to excoriate me for getting in his way. Being a Faux Laser sailor, I have no clue who the other Laser skippers were around me at the finish so I couldn't do a countback. Anyway, a Faux Laser sailor shouldn't care about where he finishes (yeah right!). The third and final race, I was able to pick up 2 or three Lasers at the finish when the wind dropped away and went hard right. Light air was never my forte but in light air you race with anybody and everybody. I rounded the leeward mark in one race with a junior sailing a Radial rig and I spent much of the next two races tied at the hip with a grey Laser sailed by a petite woman who, I discovered back at the dinghy park, was a grandm.... ahem! .... a woman about my age! Great fun! One of these days I'll write a blog doing that list thingie about "Why I like sailing my Classic Moth more than a Laser". But bottom line, there were more Lasers racing (25) in this SSA summer series than Classic Moths have racing at their nationals. And hey, I didn't have to hike on that flat deck at all that Saturday! .... well maybe some on the way into the club. Update: Team APS was also sailing Lasers in the SSA summer series and APS blogger Chris Teixeira jots down his thoughts on the day. This one is very tasty, if you like hoppy beers. The monster A scows were racing their national champs at Oshkosh, Wisconsin this past week. Two YouTubes popped up, featuring the same A scow crew filmed with a transom mounted video camera. The first YouTube wasn't from the nationals but possibly a club race at Oshkosh about a week earlier. You get a good sense of the teamwork it takes to get these big scows around the course. The second video from the nationals features a long thundering two sail reach with that peculiar scow bow wake folding over and out as the lake rushes by, the boards whine and the flat bottom thumpa-whumpa's over the waves. Mesmerizing! I would love to do a club race in one of these sometime.